Today at Tai Chi someone brought Irish soda bread. It was so much better than my Irish Grandmother's. She was a terrible cook. Maybe they were so poor they had nothing to cook most of the time. She told me that the family survived the potato famine by eating the dead. 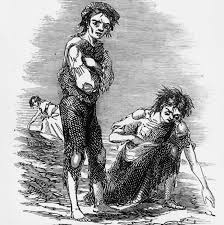 It was often the Irish absentee aristocracy that evicted their tenants and sometimes sold them as indentured slaves to to the US. Anyway, maybe my forthcoming book, 'Cooking the Rich, a post revolutionary necessity' arises from my cannibal genes. It is in editing.